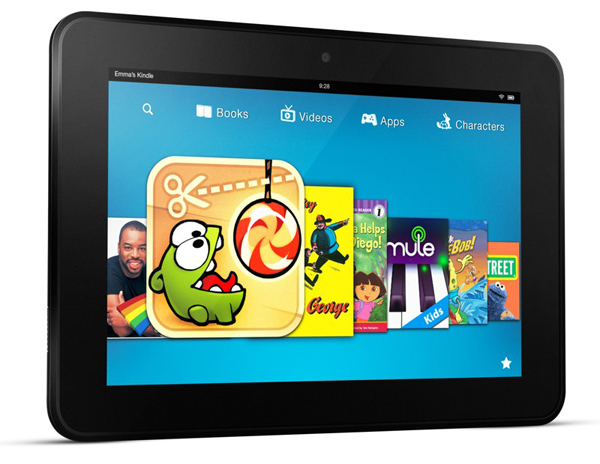 Amazon has announced its new Kindle Fire HD tablet today. Amazon's Kindle Fire HD comes in two different display sizes, an 8.9-inch HD display and a familiar 7-inch HD display, with the resolution of 1920x1200 (254ppi) and 1280x900 on the 7-inch variant. On the outside, the Kindle Fire HD is slimmer than its predecessor coming in at 8.8mm thick (7-inch Fire HD is 10.3mm thick) and employs a polarized filter to reduce glare by 25% offering better contrast and sharpness. Under the hood though, the Kindle Fire HD has a lot to offer with a 1.5GHz dual-core processor (the 7-inch Fire HD has a 1.2Ghz dual-core processor), a PowerVR graphics core, superior Wi-Fi performance over the iPad 3 thanks to its dual-band 2.4GHz - 5GHz using dual antennas, back-firing stereo speakers enhanced using Dolby's audio engine, front-facing HD camera with Skype and HDMI output. Specs out of the way, Amazon's Kindle Fire HD features a similar carousal home screen interface and soft-touch matte coated backside finish as the Kindle Fire. You'll also find pre-loaded custom Facebook and Skype apps, Whispersync cloud storage syncing for Voice and Games that'll save your game playing, levels and audiobook listening progress right were you left off. Another notable Kindle Fire HD feature is FreeTime - a kid-friendly parental control mode that allows parents to set usage durations per activity. The Kindle Fire HD 7-inch tablet is priced at $199 and $249 for 16GB and 32GB, respectively. The 8.9-inch Kindle Fire HD tablet is prices at $299 and $369 for 16GB and 32GB, respectively. Both will be available to pre-order starting today. Shipping starts September 14th, while the 8.9-inch Kindle Fire HD will only ship out on November 20th. But that's not all! Amazon has also announced a 4G LTE equipped, 8.9-inch Kindle Fire HD model with 32GB and 64GB of storage for $499 and $599. It'll ship on November 20th with a 250MB AT&T monthly data plan at $50 for a full year.